This Teak Estate Chair offers contoured arms and seat panels for maximum comfort. 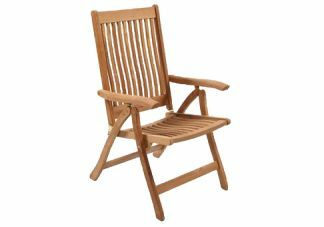 This teak chair reclines to 5 positions, making it a great choice for dining or reclining all day/night on the patio. All hardware is solid brass. Ships folded and fully assembled. To preserve the natural golden teak color, simply apply teak sealer to your teak furniture. Left untreated, teak will weather to a nice gray patina. Whether you use teak sealer or not, the strength and structural integrity of the teak furniture remains, offering years of reliable service in almost any setting.